Sunday morning, October 7th, 2018 was sunny and crisp and had the look of a day for an almost perfect fall ride. The road to the packing area for this ride was still damp from the rain the day before, so no dust, and it had been graded recently so was pretty smooth. By 10:15 all the members who had signed up for the ride where finishing up getting their horses ready and by 10:30 we were heading up the left fork of the road to the gate that allows you to enter the south-west corner of this BLM area. The gate was open, so we didn’t have to stop and the group spread out to climb up to the top of the first rise. There is no defined trail here, so members were picking their way up the hill side. Shannon, Nancy and two other riders were leading the way and Shannon’s horse wanted to lope up the slope. Shannon tried to slow her to a walk, but instead the mare reversed course and started loping down hill. This lope, turned more buck like and Shannon was pitched face first down the slope. Where she lay not moving. The group sprang into action, with half seeing to Shannon and the others catching her horse and holding the others. The first aid kit was taken off the back of Rob’s saddle and a patient assessment was started. Shannon was awake and aware and was able to tell us what she though was going on. She was able to set up after a bit and indicated she though she might have broken her arm or dislocated her shoulder. Under Shannon’s guidance for the most comfortable position of the arm, we used a down vest rolled up to act as a pillow and place it between her body and her fore arm which she was supporting. We then used her jacket and some vet-rap to fashion a sling. This arrangement allowed Shannon to walk back to the road while other brought her horse. By 12:00 Shannon was on her way to further medical care. I talked to Shannon at 17:30 Sunday night, and she said that she had dislocated her right shoulder which had been restored to it’s correct location, but she had also damaged some tendon and ligament attachments which would require further medical attention. 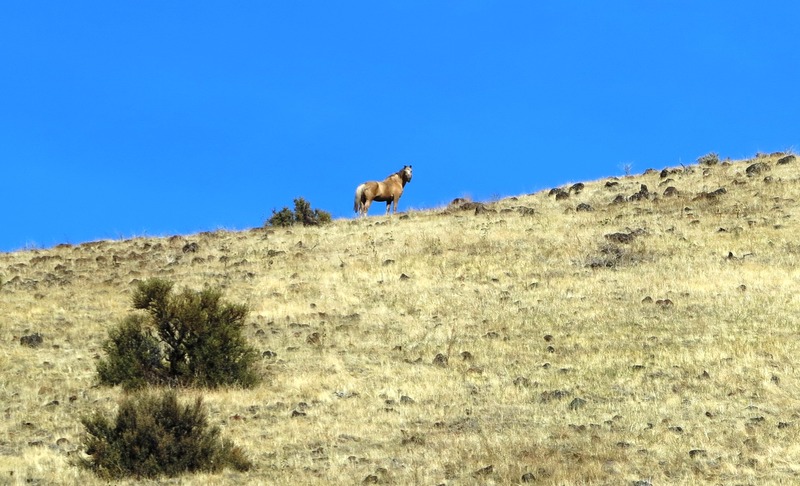 The members who continued the ride saw a coyote, hawks, antelope and ten mustangs. The shoulder is your body’s most mobile joint because it can turn in many directions. But this advantage also makes it easy to dislocate. A partial dislocation (subluxation) means the head of the upper arm bone (humerus) is partially out of the socket (glenoid). A complete dislocation means it’s all the way out. Both partial and complete dislocations cause extreme pain and unsteadiness in the shoulder. The shoulder muscles may have spasms from the disruption, and this can make it hurt even more. Symptoms include swelling, numbness, weakness and bruising. Sometimes a dislocation may tear ligaments or tendons in the shoulder. Once in awhile, the dislocation may damage the nerves. The victim will guard the shoulder and try to protect it by holding the dislocated arm in a fixed position away from the chest wall. The victim is unable to touch the opposite shoulder with the hand on the injured side. 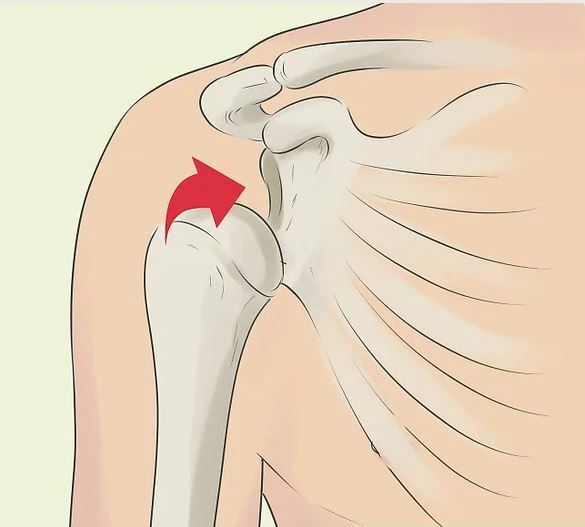 The shoulder joint can dislocate forward, backward or downward. The most common (90 percent) type of shoulder dislocation is when the shoulder slips forward (anterior instability). This means the upper arm bone moved forward and down out of the joint. It may happen when the arm is in a throwing position or held up high over the head, as in kayaking. So what do you do if you come across someone with a dislocated shoulder? 4. Check the pulse at the wrist for signs of circulation. If there is no pulse, medical care should be sought immediately. 5. Seek medical care. Transport the victim in a sitting or semi-seated position. If you and the patient are in a remote location and far from medical care, an anterior dislocated shoulder can be put back into place (reduced) if you have proper training. It should NOT be attempted when medical care is near or when proper training is absent. At the hospital or doctor’s office a doctor will examine the shoulder and may order an X-ray. It’s important for the doctor to know how the dislocation happened. Was it an injury? Has the patient ever dislocated the shoulder before? The doctor will place the ball of the humerus back into the joint socket. This process is called closed reduction. The severe pain stops almost immediately once the shoulder joint is back in place.